New Neighborhood! And New Neighbors? Moving can be a challenge because you lose the close connections you had with prior community members and need to start fresh. Greeting new people can feel awkward and uncomfortable if one does not have a game plan. 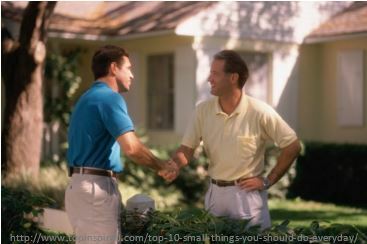 Here are some great tips that will help create a comfortable environment that is conducive to meeting your new neighbors! Everyone is busy throughout their summer, but try to spend time outside, fire up the grill, mow the lawn, weed the garden, and create a chance encounter. If you have no yard and no deck, take walks to the park and greet those around you with a friendly smile. A warm smile can often lead to a friendly conversation! 2. Be a Hand Shaker! Making goals to shake a certain number of hands per week can help get you out of your shell and meet new people! Whether you see people in the store, on the street, at the post office, or just passing by, try to greet them and offer a warm “Hello”! 3. Give a Peace Offering! Neighbors often appreciate gestures of kindness such as a warm meal, potted plants, baked goods, or even a piece of local history. The best time to give gifts is when the neighbors are already outside or by making a quick visit on the front porch. It only takes about 15 minutes to meet someone new, have a short chat, perform a gesture of kindness, and make a connection! Sometimes you just don’t have time to bake a gift, shoot the breeze, and make a visit! Perhaps you can take a moment and write a note to those neighbors in the closest vicinity and either mail it or leave it on their porch. This may be the best method for you to introduce your family, welcome someone to your community, and open lines for further communication! These scenarios will help you and your family meet the new neighbors, no matter who is joining the community! You never know, that neighbor could be Fred and Ethel bringing laughs, Wilson giving advice, Penny bringing romance, Kramer keeping things fresh, or even Chandler and Joey as a comedic and hungry duo!